Either I am going soft, or having the Radish is metamorphosing me into a full on European-style utility cyclist, as when I left work tonight it was a bit chilly in my cycling shorts and jersey, and for the first few minutes I thought longingly of how much more comfortable I would be all rugged up and riding the Radish. However after a few minutes I warmed up and started to enjoy myself. However that enjoyment was curtailed by a slight wobbling, loose sensation on the right side of the handlebars. Immediately my mind jumped to this incident, also on a fixie. I cautiously experimented with where it might be coming from, and was able to ascertain it was not the actual bars, but the brake lever seemed to be coming loose. 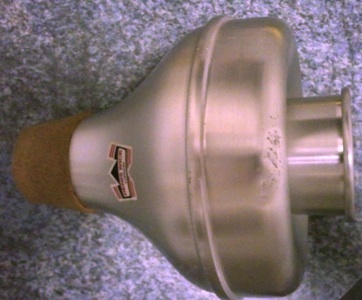 I continued to ride, putting less pressure on the hoods, but it continued to loosen further. I started to get worried that if I needed to brake hard the whole thing might come off with unpleasant consequences. I therefore switched to riding on the tops, and refrained from using the front brake at all whilst generally riding more sedately. I reached the first set of lights on the cycleway after the Sydney Harbour Bridge, and as I rode up to them I saw the opposing car traffic signals go red. Excellent; I was about to get a green. I therefore continued into the intersection before realising my error; the light phasing was not what I was expected and I was suddenly in the path of oncoming traffic. Ooops. I quickly got across and out of the way, thankfully clearing the junction in good time and not even getting honked. Not at all clever though, and definitely not a good look. I did smile wryly to myself afterwards, though – blasting through a red light on a fixie with defective brakes. I managed to tick a few boxes on the stereotype tonight. Lull’d in rest on a wild berry pillow. 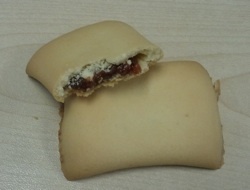 This romantically named biscuit is the sister of the Spicy Fruit Roll, although filled with jam rather than Christmas. Are the berries truly wild? I’m not sure, but in any case this is a slightly underwhelming biscuit. The filling is really just more kind of ‘sweet and vaguely fruity’, and the roll part is a bit anaemic too. I somehow can’t imagine these going down too well at a faerie tea party – I doubt they would compare well to purple grapes and honey bags. Probably better than dry oats, though. I’d give these a five out of ten. 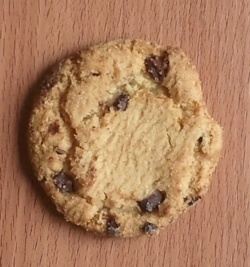 The choc-chip cookie. An international classic, apparently invented in the 1930s in Massachusetts. 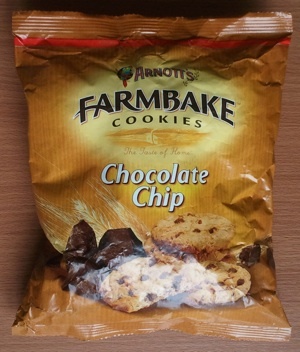 Arnott’s evidently want to bring a kind of rural idyll to mind with these biscuits, as they form part of the ‘farmbake’ range. They also come in a bag, rather than the more usual packet. This means that there are always some broken morsels to be enjoyed from the end of the bag which is fun, but also means the biscuits are generally covered in a light dusting of crumbs which form as they are transported. As far as I can tell, they are identical to the mini version Arnott’s also make, with one exception. The mini version has 24% chocolate chips, whilst the grown-up version has only 13%. This is because there is an international standard that states that Chocolate Chip Cookies have to contain at least 12 chocolate chips, meaning that smaller cookies often end up with more chocolate in order to comply with the standard. In any case way they taste just like their mini counterparts, except they last longer. The bag is also quite large at 400g, which is very welcome after the rather spartan portions found in the mini ones. For some reason we always seem to have these when on a long car journey, so usually arrive at our destination with crumbs all down ourselves. I’d say a solid seven out of ten. I arrived and was looking for somewhere to lock up the bike when suddenly I was approached by someone. ‘I know you!’ she declaimed vehemently, staring at me with wild eyes. Oh dear. One of those unwanted interactions that makes for an uncomfortable few moments. Was she drunk? Crazy? My answer of ‘No, I don’t think you do’ was ignored as she continued. Noting that she had two other friends approaching (another woman and a man), I decided it was time to leave. ‘I’m very sorry to hear about your dog, but it has absolutely nothing to do with me. Excuse me’. I swung my leg over the bike, and started to pedal away. The guy runs after me and grabs the back of the bike. I’m debating whether to pedal harder and try and break his grip or stop when I see the two friends I am meeting. I have to say, I was quite pleased to see them. Relieved, in fact. I stopped, and further conversation ensued between the six of us. The woman repeats her accusation; her dog was run over in a nearby park by someone on a bike ‘exactly like’ mine, with a bell that sounds ‘exactly like’ mine. I actually think this is unlikely; I’m riding the Radish which is hardly a common sight, and I have an old-school ‘bring bring’ bell as opposed to the usual ‘ting ting’ variety. Still, this is not the sort of argument that is going to be won by logic. There is a breakthrough. One of my friends knows a friend of a friend of one of the trio accusing me of dog-hitting. Agreement is reached that I am in fact probably not responsible. Apologies are muttered. I lock up the bike and we go in for the beer that, by now, I am really in need of. We are ordering at the bar when the dog-woman comes in. ‘I am so sorry,’ she says. ‘My dog was hit by a cyclist and was badly injured and I’m very upset, but I shouldn’t have accused you. I am so sorry’. I tell her that it is all fine, but she insists on buying us all a drink to apologise. So all is well that ends well, but if anyone does know of a dog-hating radish-riding bring-bring-bell-toting outlaw who ran down a Jack Russell terrier in a park in the Lilyfield area some weeks ago perhaps you could encourage them to turn themselves in? A little while ago we looked at the new Tim Tam Dark Mint, and I noted that it was introduced with a companion biscuit, the ‘Rum and Raisin’. I have now had the opportunity to sample the Rum and Raisin variety, and can report back. My first experiences with Rum and Raisin flavour were when I was a small child, and we used to go to stay with relatives on the coast for the summer holidays. Occasionally we got an ice-cream, and the local ice-cream emporium had six flavours – the ‘normal’ ones (vanilla, strawberry, chocolate) and the ‘luxury’ ones (mint choc chip, tutti frutti and rum’n’raisin). Of course, the rum’n’raisin seemed by far the most exciting, and the one we used to pester our parents to buy for us. I actually recall that I wasn’t very fond of the flavour, but asked for it anyway. Such is the effect of peer pressure; nowadays I am much more confident in who I am, and can ask for vanilla whilst only feeling slightly self-conscious. Anyway, how do these new Tim Tams measure up? Are they going to be an improvement on my 1970s ice-cream experiences? They are packaged up in the same sophisticated design, although at first glance it appears that the biscuits are accompanied by some cherries, and a mint leaf. I think these are actually grapes and the leaf from a grape vine, but it’s a little unclear. This ambiguity is carried through in other areas, as we shall see. There is also a stamp that indicates that they are made with Jamaican rum. The small print indicates that the biscuits contain less than 0.1% alcohol, so by my calculations you’d have to eat around 500 packets to get the equivalent of one standard drink, so it’s probably OK to eat a Rum and Raisin Tim Tam and then drive. The biscuits look and smell like regular dark Tim Tams, however they are filled with a slightly chewy, jammy filling. To my mind it tastes a lot more like cherries than raisins; indeed coupled with the pack artwork I suspect if these were marketed as ‘dark cherry’ flavour there would be no complaints. They are certainly not especially raisiny, and the rum is pretty much undetectable. They are actually quite pleasant, but certainly not as good as the Mint version. I’d give them an eight out of ten. 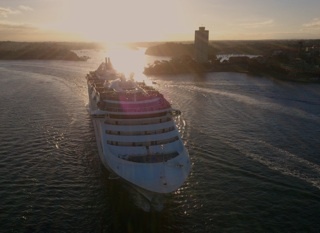 On the way home on Friday, I happened to be riding across the Sydney Harbour Bridge at the same time a cruise liner was passing underneath. It was quite a sight, and along with many other cyclists I stopped to watch it go by, and wave to the passengers crowded on the deck below. Many of them waved back, and the height of the vessel meant they were close enough to call out to as they went underneath. “Goodbye!” they called, and “Thank you Sydney!”. At the time I was thinking that how nice it was that these holidaymakers last memory of Sydney would be being waved off by a bunch of friendly cyclists as they passed under the iconic bridge. However, on reflection, I actually think it would have looked more like a bunch of prison inmates frantically trying to get attention; arms thrust through the narrow gaps in the barbed wire fencing. This is because, Australia being a Nanny State par excellence, people using the walkways and cycleways of the lovely Sydney Harbour Bridge are penned in by three metre high fencing on all sides that curves in at the top to clearly display the vicious barbs on the topmost wires. It’s fairly horrible, and in huge contrast to, for example, the Golden Gate Bridge in San Fransisco. Another iconic bridge over a harbour but there people are free to enjoy the views unimpeded. The road pictured is Balmain Road, Sydney. 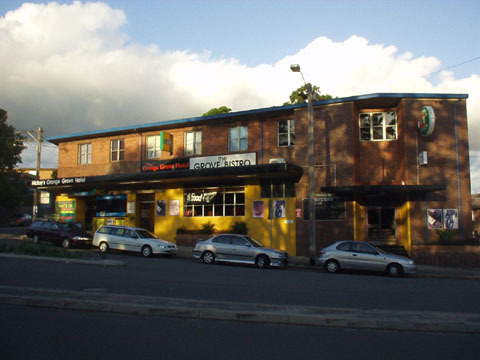 It is one of the routes into Rozelle / Balmain, a popular suburb of Sydney replete with nice cafes, funky shops and interesting markets. It seems to be especially popular on Saturday mornings; indeed so popular that the queue of traffic on Balmain Road was around 2km long. I was walking along the road at the time pushing Baby Chillikebab in her pram, and the traffic was travelling at about the same speed as we were – say 4km/h or so. 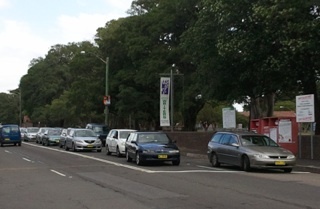 This means the people in the cars were prepared to wait around half an hour just to get into Rozelle. Once there, they then would the need to find somewhere to park – easily another fifteen minutes. That’s forty-five minutes in total – let’s hope that latte or antique vase is really worth it. It’s quite extraordinary really; in that 45 minutes those people could have virtually cycled from Bondi, as this useful map shows. I’m fairly confident that the vast majority of those people queuing up on Balmain Road live less than a 45 minute cycle away from Balmain. However, I’m also fairly confident that, if asked, they all would have had a really good reason why they could not have ridden that day. “too hilly’, ‘too dangerous’, ‘too slow’, ‘too hot, ‘too cold’ etc etc. I observed as we walked that the cars were about half and half split between people on their own and couples, with rather few families. Another interesting thought is that if each car is about 4m long, and there is a 3m gap between cars, then there were about 285 cars on that 2km stretch of road. Assuming one and a half people per car on average, that’s about 430 people. A Sydney Transport Authority bus can hold between 44 and 79 people depending on the type, so we could accommodate all those people in around nine buses. A bus is about 13 metres long, so nine buses only need about 150m of road – around 8% of the road space taken up by the 285 cars. That’s all a bit by the by; people evidently don’t want to cycle, or go on the bus – otherwise they would be doing it. It’s a free country after all, and people can choose how they want to get about. I suppose the bit I am puzzled by is why they want to sit in their cars for that long. I mean, I know Balmain is nice, but it’s not that nice, surely? Or maybe these people find the interior of their car much more interesting that I find the interior of mine? All very mysterious. One of the things I like about the area of Sydney where I live is that rather than chuck stuff away, people leave it out on the footpath for a while first. It’s amazing how much stuff gets carted off by people to be re-used; I’ve got rid of all sorts of things this way, and its much more satisfying that putting it in the trash or taking it to the tip. I generally don’t collect stuff from the side of the road as we hoard enough already, but we went to the park for a picnic today, and saw a rather handsome solid wood table out on the pavement which we thought might fit in the kitchen. So I went back later that afternoon to pick it up. It was still there; and needless to say I went on the Radish. I strapped the table on the back safe and sound, and rode home. As I rode back I was reflecting on how much easier and quicker it was than driving; if I had taken the car I would have had to go around the one-way system to get there, find a place nearby to park, carry the table to the car (and it was quite heavy), put the back seats down to get it in (possibly having to remove Baby Chillikebab’s seat first), then circle back via the one way system to get home to do it all in reverse to unload. 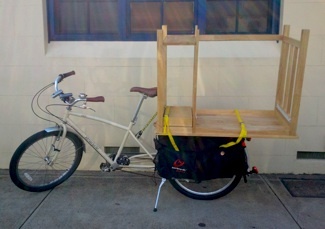 As it was I rode right up to where the table was on the footpath, loaded it up in about thirty seconds, then road straight home, pushing my bike right up to the back door to unload it next to the kitchen. I’m fairly confident, though, that most people if asked the question ‘what is the most convenient way to transport a small table‘ would unthinkingly answer ‘by car‘. People are so blinded by automobile headlights that they fail to see that there are other – often better – options. I had a big band gig tonight, and as usual packed up all my stuff onto the Radish to get there. Well, actually I loaded it up this morning, then rode to work, and then rode from work to the gig, which meant I did about fifteen kilometres further than necessary with twenty kilos of stuff on the back of the bike. Good for the legs, I suppose. I had to go to the gig straight from work as we had a sound check at 5.30pm, prior to the guests arriving for pre-dinner drinks. We were due to play after dinner at around 8.30pm, but the speeches ran on and on. We didn’t actually start playing until about ten minutes to ten, and consequently played only about third of the charts before the venue management told us we had to stop. We did get given beers though, even thought they were explicitly excluded from the contract, so that was nice (although we did wonder if we would get a bill at the end of the night, Blues Brothers style…). At the end of the gig I packed up my stuff back onto the bike and rode home (much to the amusement / admiration / disbelief of my fellow musicians). However, I must have been tired as I didn’t pack it very well, and as I got close to home my Harmon mute escaped from the panniers. It bounced along the road, thankfully not going under any car wheels. It does now have a nice scrape and a few dents, which is a pity. The frustrating part is, of course, that we didn’t play any numbers which actually called for the damn thing, so I could have left it at home! This morning, I needed to get some milk, so popped out to the corner shop just down the road. It’s one of those amazing local shops that seems to have rather random opening times. When it is open you go in and discover they do all sorts of things; they sell funnels and will cook you a fried egg sandwich. Fertiliser is on the shelf next to the baby food. They stock gas masks. Now, as I’ve mentioned before, such corner shops are a treasure trove of rarely-sighted Arnott’s biscuits, and on this occasion I was not disappointed. Because on the shelf was a packet of Morning Coffee – a variety I have never seen elsewhere. It was immediately apparent, however, that this was no ordinary packet. The packet design was of the old, out-of-date sort. Arnott’s changed away from this design several years ago, so what was this packet doing here? I turned it over to see if it was indeed an ancient relic, long past its sell-by date. But no, it was current, with a sell-by date of March 2011. Well, here was a fascinating anomaly. I of course had to buy it, and rushed home in excitement. Such excitement, in fact, that I forgot to buy the milk, and then had to go back again in order to be able to make tea. Interestingly, the Morning Coffee variety does not feature on the main Arnott’s website. Is this line being phased out? Have I secured perhaps a packet from the last ever batch of Morning Coffee ever made? And if so, why have they stopped making it? A little more research revealed that the Morning Coffee can still be found on the ‘Arnott’s Food Service’ website. Hurrah! It’s not completely dead then. Still, it’s omission from the main website, and the outdated pack design are rather worrying, as if it is on a list to be axed. Please don’t do it, Arnott’s! We love your glorious multitudes! Anyway, for all that, what is it like? Well, it’s a quite thin rectangular biscuit, embossed with what seems to be a representation of the TV test card. It seems a little institutional, like the kind of biscuit you would get at a hospital, probably with a cup of tea served in a green cup and saucer. Perhaps this is the main market for this line, which explains why Arnott’s do not promote it on their consumer website. It’s made with golden syrup, and it does have a faint syrupy taste. However don’t get too excited; this is a very boring biscuit. On the plus side it dunks into tea very well indeed; I didn’t try it with coffee because the only coffee I like is espresso and it just seems weird to dunk a biscuit into a thimbleful of strong coffee. But with tea it was really quite good. It’s pretty much par for the course, as these types of plain biscuits go. With a cup of tea I did manage to nosh through half the packet. I’d give these a very creditable four out of ten.